The 10 Best Steakhouses in Kentucky! Almost everyone loves a good steak. There are many places in the Bluegrass State that can serve up your favorite cut, whether it’s a 55-day aged strip steak, a filet mignon cooked to order, or a combination surf and turf plate with your choice of steak and seafood. Below are 10 of the best steakhouses in Kentucky that are sure to please your palate and satisfy your appetite! Featuring the best steaks in the area, Sahara Steak House in Cave City, Kentucky, is a prime choice for prime rib. Soup, salad bar, and your choice of a side is included with every meal, and they have a great kids’ menu, too. In addition to cooked-to-order steaks, they have seafood, and other cuts of beef designed to please your palate. You don’t have to have a special occasion to visit Pat’s Steakhouse in Louisville, but if you do, they can help you celebrate. Voted the “Best Steakhouse” by three different magazines, Pat’s has been serving people pleasing meals for over 50 years. They have several rooms inside the restaurant and a great patio and bar outside for good weather dining. Known as an authentic Irish landmark, the original building was a rest stop for weary travelers over 150 years ago. A lot has changed since then, but you can count on the same great quality food and service that’s made Pat’s Steakhouse the oldest in the area. For that extra hungry appetite, try the 32-ounce porterhouse T-bone or the 18-ounce filet mignon. What used to be a popular cocktail bar has been upgraded to an even more well-known fine dining establishment. More than just your average steakhouse, the Blue Heron in Lexington, Kentucky, you will love the charm and quiet atmosphere created by the large two-sided fireplace. Monday is half-price night for wine with the purchase of a dinner for two. Beef entrees include choices like filet of beef tenderloin, New York strip, porterhouse, cowboy ribeye, and flat iron steak. They also serve chicken, pork chops and lamb. Legends usually take years in the making, but Jeff Ruby’s Steakhouse in Louisville has been quick to rise to fame. It could be because of the live entertainment and unique interior design. Or it could be the great service and attention to detail by the servers and staff, or the fabulous raw sushi bar. It’s definitely because of the delicious Kentucky-inspired menu featuring such appetizers and sides like fried pork belly, six-cheese baked macaroni & cheese, and roasted root vegetables, and entrée items like bone-in filet mignon, New York strip, porterhouse, and a special 30-ounce aged tomahawk ribeye. You can’t stop there, because dessert will make your mouth water. Try the Bourbon District peach bread pudding for a special lick-your-lips treat. You’d be missing out if you didn’t stop by Sirloin Stockade in Murray, Kentucky. Voted “Best Steakhouse” and “Best Buffet” 14 years running, this modest family-friendly restaurant has homemade meals that rival bigger and more traditional steakhouses. Open seven days a week, you find 100 percent fresh beef seasoned to perfection, and a great buffet that’s kept fresh and full. Steaks range in size from six ounces to 12 ounces. Voted the “Best Steak” in Northern Kentucky for the past five years, Blinkers Tavern in Covington raises the bar and sets the standards for steaks, seafood, pasta, and sandwiches. Family-friendly and non-smoking, this eatery is available for large parties and groups, too. All their food is cooked to order, and steaks can be topped with mushrooms in garlic butter, lobster cream sauce, bleu cheese, truffle butter, or a crab crust. When you make the decision to eat at Le Moo in Louisville, Kentucky, you get more than just great food. You get a dining experience. With a very eclectic interior that includes gold-framed art on the walls and blue and white upholstered chairs, and a casual yet elegant mood, it’s no wonder this spot has received numerous accolades for being among the very best. Unique appetizers include pigs in a blanket, which is Wagyu hot dogs with bleu cheese, wrapped in a croissant and covered with bacon jam, and entrees feature ribeyes, New York strips, and filets with your choice of a bordelaise sauce, traditional béarnaise, Diana sauce, Bourbon-spiked five mushroom medley, truffle butter, a Bourbon-peppercorn or bleu cheese crust, or pan-seared foie gras. Get the experience any day of the week. The perfect weekend: date night at @lemoolou then @TheAvettBrothers concert. It doesn't get much better than that! Click the link in the bio for more amazing local steak houses and events going on in Louisville this weekend. Remember to subscribe so you always have weekend plans! Featuring great steak for great people as their website proclaims, these aren’t just words. Del Frisco’s prides itself on providing the best food at the best prices for their customers and won’t be satisfied until you are. With an upscale casual comfort, this hidden treasure offers corn-fed beef with added chemicals and preservatives and over 35 years of experience knowing what hungry customers like. Open from 5 p.m. to 11 p.m. every day, they also have private dining and catering for large groups. You’ll find the same quality and attention to detail with the offsite and off-site menus and service. Named after the original owner, Doe’s Eat Place in Paducah, Kentucky, is one of several Southern locations that offer true hospitality and a history as authentic as the steaks they serve. With a unique combination of tamales and steaks on the menu, everything is made the same way it was over 60 years ago. Ribeyes, filet mignons, porterhouse, T-bones, and sirloins, all cooked to order are featured along with shrimp and a nice variety of sides. Winner of numerous awards over the years from sources like Bon Appetit Magazine, Men’s Journal, Southern Living Magazine, and recipient of the James Beard Award, you can stop by any day of the week. Hand-cut meat, burgers, and other delicious menu items are what you can expect at Cattleman’s Roadhouse with multiple locations across the state. Cattleman’s is locally owned and operated and just classic people serving classic food. Open every day, there are specials every day, too, like the Friday and Saturday Prime Rib Dinner special and half-priced wine on Wednesday. Besides great food, this eatery is proud to serve outside their establishment and helps non-profit organizations with food donations. Next time you’re in the area, or if you want a nice drive, stop by Cattleman’s Roadhouse. There's a little bit of an Outlaw in all of us. This 16 oz Cattleman’s Gold Black Angus rib eye is served on the bone for extra flavor. 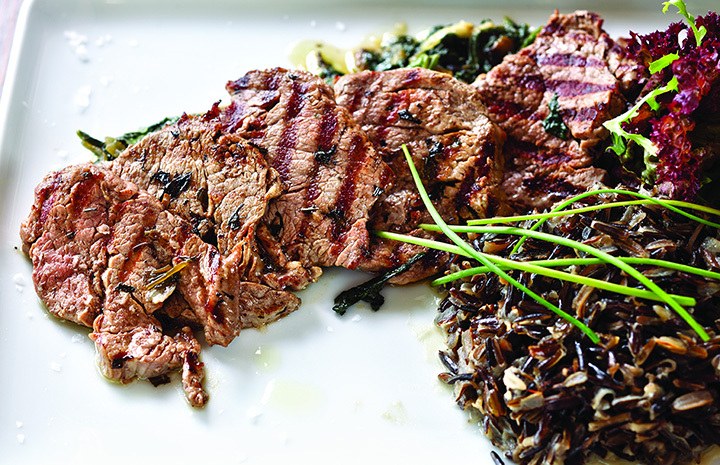 Try this juicy, flavorful, rib eye before he gets thrown out of town.